The customer required Live Media uplink encoding network solution for high quality, low latency streams for use at a 24-hour Arabic language financial and business information television channel.Live 2 way audio interviews and broadcast video transmission of financial reports were required from various business and financial institutions throughout the region to be transmitted simultaneously to the 24-hour television channel.The requirement was for a solution that was simply to setup and control and for use by non-technical CEO and finance/business representatives with no technical expertise. The system required to be remotely operated from the control room at the television channel. Standard broadband public internet connections were available at the finance institutions and at the receiving television station. A decoding live media solution was required in the command control center. Low latency IFB talkback was required for the live up-to-the-minute broadcast quality streams. 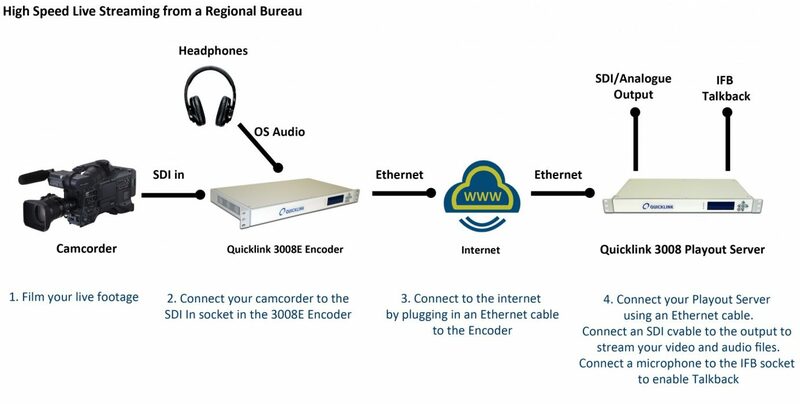 Quicklink 1U Encoder at each business location. The above solution allows the television station to receive the 2 live audio and broadcast video from banking and finance institutions in the region. The broadcast quality live video and recorded footage is viewed at the control centre with SDI Monitors. The Quicklink 1U Encoder is specially designed to be an ideal tool for this requirement. The encoder benefits from pre-set approved profiles that are optimised with advanced error concealment to work seamlessly on the public internet whilst maintaining broadcast quality. The encoding units are simple to operate or can be easily remotely operated by the receiving control centre.